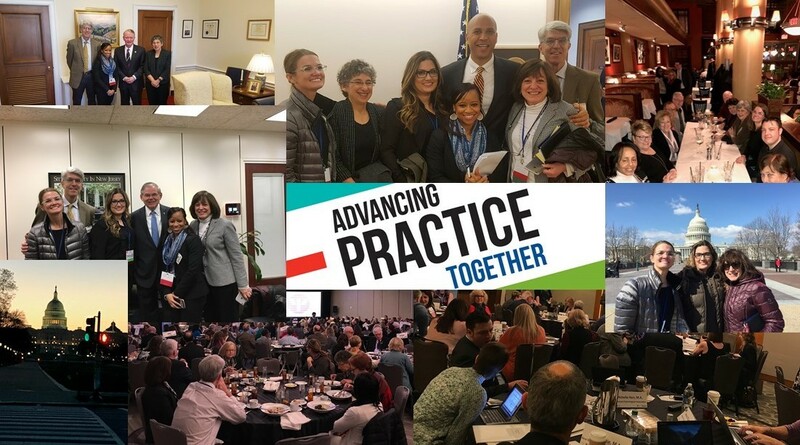 Every year, the American Psychological Association gathers delegates from state, provincial, and territorial psychological associations at the Practice Leadership Conference to provide advocacy training for leaders in the field of psychology. Following several days of training events, the delegates head to Capitol Hill to meet with their congressional and state representatives. 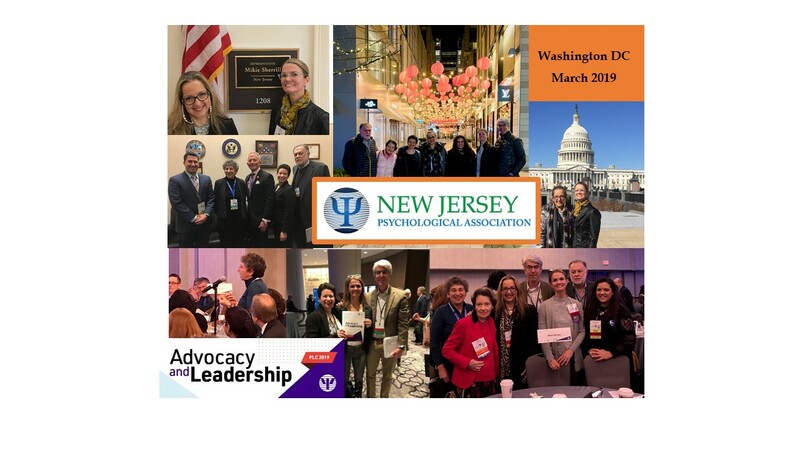 In March 2019, NJPA was present in Washington DC at the American Psychological Association (APA) Pre-Practice Leadership Conference meetings and the Practice Leadership Conference (PLC). Attending this year was NJPA delegates Drs. Morgan Murray, NJPA President, Lucy Takagi, NJPA President-Elect, Judith Glassgold, NJPA DPA, and Michelle Pievsky, NJPA ECP Delegate, along with Alex Gil, NJPA Diversity Delegate, Keira Boertzel-Smith, NJPA Executive Director, and friends, Drs. Sean Evers and Virginia Waters. PLC is the annual advocacy and leadership training conference for leaders in professional psychology practice. Each year, APA offers programming and opportunities designed to educate, connect, and empower APA and state, provincial and territories representatives. The goal is for the attendees to leave PLC with new information, resources, and skills needed to be effective and creative advocates aware of the latest trends and developments in psychology and health care policy. 2019 marked the launch of APA Services, Inc. and the inauguration of APA’s new integrated advocacy structure. As APA enters a new era and begins implementing a strategic plan approved by APA’s Council of Representatives at their February 2019 meeting, PLC presented an opportunity to examine psychology’s future and the discipline’s advocacy efforts. Attending PLC was a mix of leadership communities such as delegates, executives, and staff from the SPTAs, the APA Board of Directors, members of APA’s Advocacy Coordinating Committee, representatives from the Education, Public Interest, Science, and Applied Psychology communities, and executives and staff from APA. There was again this year a great energy and exchange of ideas. We ended our time in Washington DC with a trip to Capitol Hill. The New Jersey Psychological Association met with the following New Jersey Representatives and Senator’s offices to discuss cosponsoring two bills that remove barriers to quality mental health access for Medicare patients through bills HR884 and HR1301 and preserving mental health and substance use disorder coverage in Medicaid and private health insurance plans under the ACA. Lastly, we enjoyed having a dialogue with them about important social advocacy issues. Rep. Tom Malinowski (D-NJ-07); Rep. Jeff Van Drew (D-NJ-02); Rep. Andy Kim (D-NJ-03); Rep. Mikie Sherrill (D-NJ-11); Rep. Frank Pallone (D-NJ-06); Rep. Bill Pascrell (D-NJ-09); and Sen. Bob Menendez (Senator D-NJ). Our delegates were given strategies for identifying shared goals and forming strategic alliances with fellow psychologists, other health care professionals, and elected officials. We participated in workshops on topics such as Social Justice and Advocacy Matters: Navigating the “isms” and Building Allies, Navigating Barriers to Integrated Care from the State Perspective, and Understanding the Legislative and Regulatory Trends Promoting Quality Measurements and What to Do About it in Your Practice. On Tuesday, March 13, 2018, our delegates visited Capitol Hill to present our two asks to the offices of Ranking Member of Energy and Commerce, Representative Frank Pallone (D-NJ-06); Ways and Means, Representative Bill Pascrell (D-NJ-09); Energy and Commerce, Representative Leonard Lance (R-NJ-07); Finance, Senator Bob Menendez (D); Representative Josh Gottheimer (D-NJ-05) and Senator Cory Booker (D). We asked our New Jersey house representatives and senators to co-sponsor the Medicare Mental Health Access Act that would add psychologists to the Medicare’s “physician” definition therefore removing physician oversight and referral requirements in certain facilities, such as inpatient psychiatric hospitals, skilled nursing facilities, and rural health clinics. We noted that the Medicare population has the highest and fastest growing rates of diagnosed opioid use disorder. We also asked them to oppose any changes to Medicaid that would reduce coverage. The message was that Congress should maintain the integrity of the Medicaid program. We mentioned that Medicaid is our nation’s single largest payer for behavioral health services, covering 25% of all spending for mental health treatment and 21% of all addiction spending. With this theme, attendees explored our roles as practitioners in various political systems. APA/APAPO states legislative systems are crucial, but professional communities and institutions are also formed by politics and navigating each of them requires a different set of knowledge and skills. At the Practice Leadership Conference, we had an opportunity to strategize about how to position ourselves within those systems in order to affect policy outcomes. 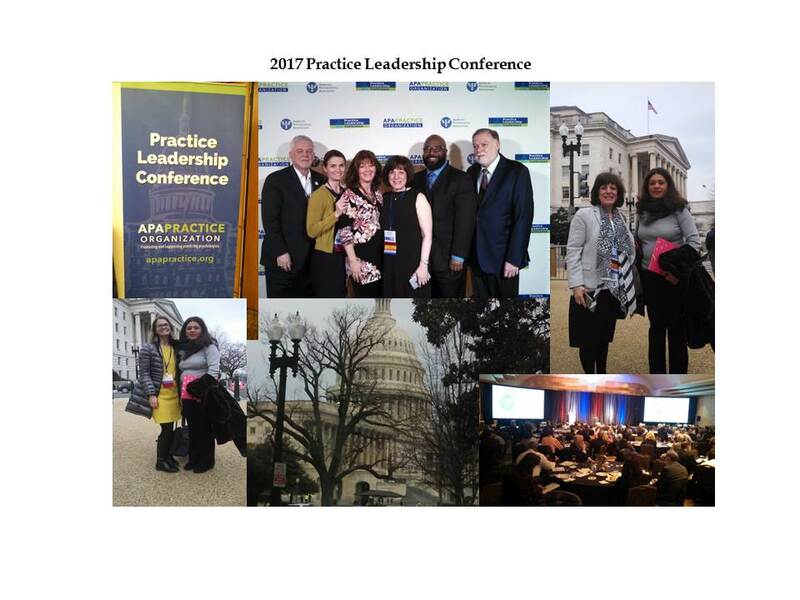 In late February, I attended the APA State Leadership Conference (SLC) with five other NJPA representatives: President, Barry Katz, PhD; and President-Elect, Hulon Newsome, PsyD; early career psychologist, Briana Cox, PsyD; Public Education Campaign Coordinator, Janie Feldman, PsyD; and Federal Advocacy Coordinator, Mark Singer, EdD. This year’s SLC theme grew out of the APA multi-state summit on integrated health care and alternative practice models. The focus was on the spectrum of opportunity and the many paths to success. In the opening session, examples of innovative paths were presented by Dr. Arthur Evans, a leader in the Philadelphia Medicaid behavioral health program, Department of Behavioral Health and Intellectual Disability Services serving underserved populations of that city in unique ways, such as a city-wide community mural project. Dr. Nancy Ruddy, with McCann Health in New Jersey, spoke on how clinical practitioners can work with community medical practices and her new role in applying psychological expertise to education tools for patients in helping them manage a broad array of medical issues. Dr. Geoffrey Kanter spoke about the large multi-health care provider practice group model and the Management Services Organization (MSO) model that would allow psychologists to become members of an organization that provides non-clinical business services at discounted rates. Breakout sessions at the conference included topics such as alternative practice models, aspects of chronic illness, tools and tips for independent practice, challenges to psychological assessment, scope of practice, serving the underserved populations under the Affordable Care Act, new practice models, risk management and legal issues, and participation in Medicaid and Medicare. The SLC always ends with a trip to Capitol Hill to present the current APA federal legislative agenda. To prepare us for our political venture, Mark Shields, a nationally known columnist and commentator with PBS NewsHour, presented us with unique insights on today’s current political events; Representative Tim Murphy (R-PA) spoke to us about the need to improve our mental health system; South Dakota House Representative Kristi Noem was honored for her mental health work; and Former Governor Ted Strickland (D-Ohio), a candidate for the US Senate and psychologist, was recognized for his outstanding record of advancing mental health services. As with the 2016-2017 NJPA legislative agenda, the APAPO focus is on access to mental health care. The first is the longstanding issue of raising the need to add psychologists to the Medicare definition of “physician” in order to remove an unnecessary layer of physician supervision and to help patient access psychologists’ services. The second legislative issues emphasized the need to enact consensus, bipartisan mental health reform legislation that makes structural improvements and strengthens the fragmented mental health system in order to increase patients’ access to effective and evidence-based care. You can read about both legislative issues on the APAPO website. We spent March 1, 2016 on Capitol Hill visiting the offices of New Jersey Representatives Bonnie Watson Coleman (D12), Tom McArthur (D3), Frank Pallone (D 6), Leonard Lance (D 7), Rodney Frelinghuysen (D11), and Bill Pascrell (D9) to advocate for these important mental health access issues. We requested that the New Jersey members of Congress cosponsor the Medicare Mental Health Access Act to allow psychologists to practice without unnecessary physician supervision, and to enact consensus, bipartisan mental health reform legislation. I thank the 2016 NJPA delegates for their time, energy, and work on Capitol Hill. 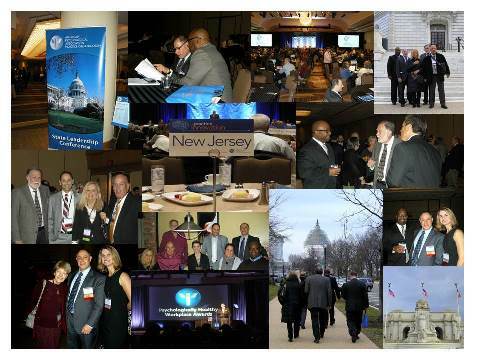 NJPA attended the 2015 State Leadership Conference and made Capitol Hill visits. 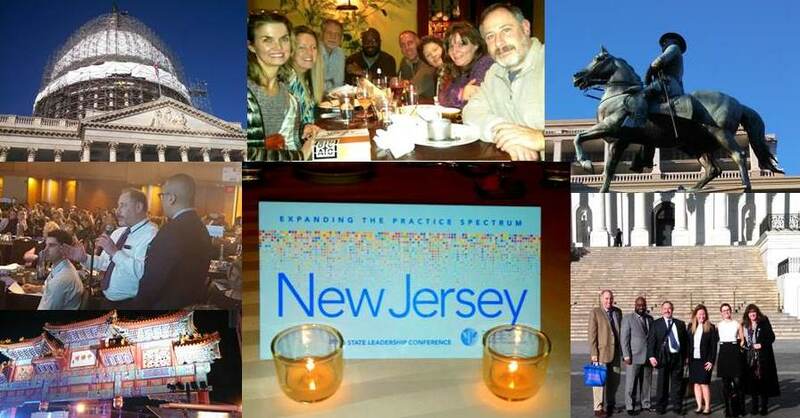 This year's delegation included NJPA President, Kenneth Freundlich, PhD; NJPA President-Elect, Barry Katz, PhD; Director of Professional Affairs, Barry Helfmann, PsyD; Federal Advocacy Coordinator, Hulon Newsome, PsyD; Federal Advocacy Coordinator, Keira Boertzel-Smith, JD; Diversity Delegate, Marta Aizenman, PhD; , and Public Education Coordinator, Lynn Schiller, PhD. The 2015 APAPO federal advocacy priorities are Medicare reimbursement, Medicare physician definition, and health information technology. To read more about the advocacy priorities, click here. The Saturday afternoon keynote address was given by Jason Hwang, MD, who spoke about a disruptive solution for health care. He stated his belief that health care reform starts with changing its longstanding and outdated business model, one-size-fits all delivery system that struggles to do everything for everyone. It was interesting to hear about the big picture changes in business models and how they relate to health care. The NJPA delegates went on to meet with their peers in networking groups. That night, Betsy Myers, Founding Director, Center for Woman and Business at Bentley University, spoke before the APA’s 2015 Psychologically Healthy Workplace and Organizational Excellence Awards about leadership and workplace engagement and shared stories about her time working with Presidents Clinton and Obama. On Sunday, the delegates heard from Ann Compton, former White House correspondent for ABC News who discussed current events and the 2016 presidential election. NJPA President-Elect, Barry Katz, PhD, was able to ask a question of her, see here. Each delegate then broke off to attend specific subject matter workshops, such as PQRSPRO Registry, developing an integrated care practice, ICD-10, insurance advocacy, regulatory boards, and federal advocacy training. We ended with a group government relations issue briefing. On Monday, we started out with an excellent presentation by Andy Goodman, Director of the Goodman Center, and nationally recognized speaker and consultant in the field of public interest communications. The presentation was tailored to learn to shape information about our association to potential new members; be more effective in delivering advocacy messages; and use storytelling skills when communicating psychological information to the public. We had a great storytelling exercise that was thought provoking and emotional. We continued on with workshops including removing barriers within Medicaid, membership recruitment and retention, and CPT terminology. That night, the Honorable Heidi Heitkamp (D-ND), member of the United States Senate, shared passionate stories about mental health care in her state. 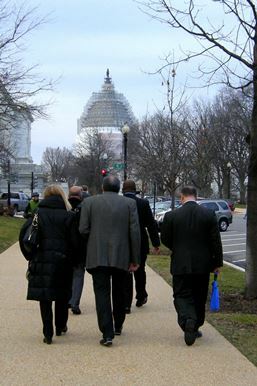 We were up early Tuesday morning for seven great Capitol Hill visits. We visited the offices of Representatives Donald Payne Jr., Bonnie Watson Coleman, Tom MacArthur, Chris Smith, Leonard Lance, Bill Pascrell, and Rodney Frelinghuysen. Our four “asks” of the Representatives were to vote yes to repeal the Sustainable Growth Rate (SGR) to avoid the 21% cut in Medicare reimbursement rates, cosponsor the soon to be released legislation that will fix the Medicare payment formula, add psychologists to the Medicare definition of physician in order to remove an unnecessary layer of physician supervision and to help patient access to psychologists’ services, and lastly to make psychologists eligible for the HITECH Act electronic health records incentives.